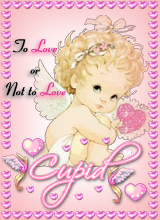 Cupid - "To love or not to love"
I like to fly around shooting people with bow and arrows. And mind you i didn't break the law doing that. Because people want to be shot by me. And they will feel great and lucky if i did shoot them. Cymae - "I like satin and ribbons!" Her outfits are all elegant and gorgeously detailed, and her DO Derivable meshes are the easiest to derive from by far! Cymae's favourite colors are red and black, which she has put all over her homepage and worked into her favourite outfits. Cymae lives in Australia and is studying to be a 3D Designer, but loves IMVU because it lets her express herself and her personality. Cymae loves feedback, is wound like a top, and is always happy for a chat! DeCulture - "Time for a New Culture. Revolution Beckons." Hot and Promising upcoming new talent. 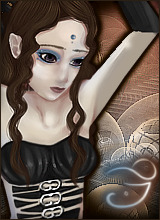 EliaDesigns - "Evil is just a point of view"
Joined IMVU in February 2007 and started to develop just a few days later. She loves to create unique and special items with high quality. One of her specialties are wordborders for the homepages and unique hairstyles. One can also find furniture and clothing in her catalog.